We headed out around 9am and the trails were in great shape again. We rode trail 13 into Rockland and then took trail 3 all the way to Copper Harbor. It was snowing pretty good and that helped conditions. Everything was great until we got about 30 miles from Houghton and then 15 miles on the other side of Houghton. It was soupy through there. We ate breakfast at the Linville Cafe in Lake Linden and then made our way to the Mariner in Copper Harbor. 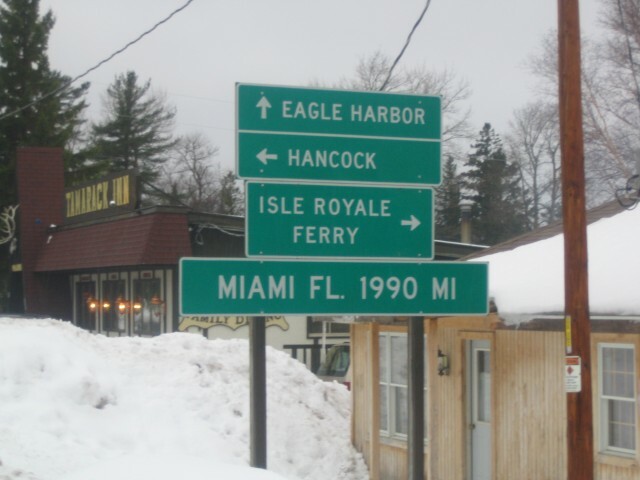 One of our guys decided to take his own route to Copper Harbor and got lost. We ended up meeting back up with him in Phoenix on our return trip. 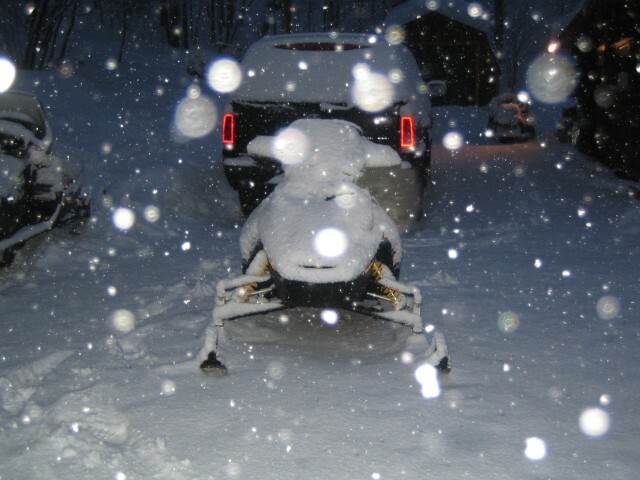 We got back to the cabin around 6pm and trailered the rental sleds back to Bergland. Today was another eventfull day. We headed down trail 13 and rode the lake to get breakfast at the fisherman. 13 was in awesome shape this morning and we were the first sleds on it. We ate breakfast and gased up and then headed for the snowmobile dealer. When we arrived we noticed that the last guy in our group never showed up. After paying for my sled we headed back across the lake to look for our buddy. His sled was under tow and they were headed for town. We started to turn around and two of the guys had a little fender bender. Everyone was ok so we headed to town to meet up with our buddy that was being towed. After re grouping we headed back to the cabin to get the truck and trailer so we could get the broken sled back to the cabin. One of the guys rented a sled from the dealer and we were back in business. For dinner we wanted to go for an easy ride so we went to Twin Lakes and got dinner at Park View. This is a pretty nice place and I’d recommend it to anyone if you are in the area. After dinner we headed back and got our sleds ready for Copper Harbor tomorrow. After all the crazy things in the last 3 days we were hoping for an uneventfull day. We finally got one! 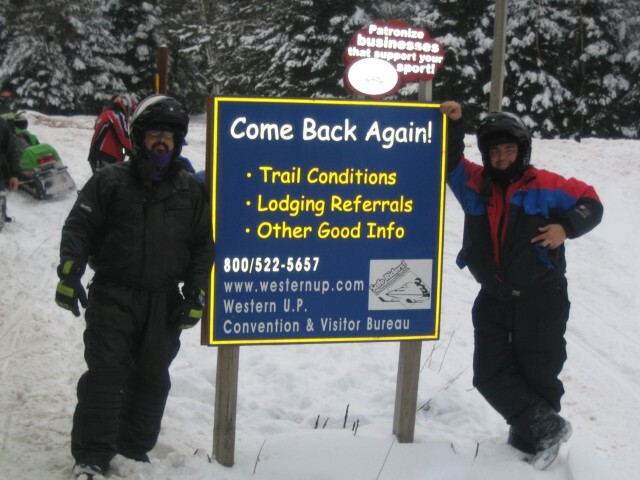 We rode the sleds down trail 13 and 8 to the dealer and dropped off my sled to have the hyfaxes changed. Trail 13 was in great shape again today! The guy that had his motor blow yesterday rented a sled and we were on our way. We headed to the Root Cellar for lunch and then rode trail 13 to trail 2 and then trail 1 south to Presque Isle. Trail 13 was in good shape the whole way and trail 2 was a little washed out from all the traffic. Trail 1 was kinda bare and had some icy corners which is pretty typical for this trail. After getting gas in Presque Isle we headed to Skyview Lodge for a bit. We left there and decided to take a different route back. We rode trail 1 north to trail 2 east. We took that to Watersmeet and got gas there. Then we took trail 2 east a little further and then rode trail 107 north to trail 105. Normally these trails are in great shape because they are so wide and flat. They were a little rutted today due to all the traffic, but overall were in fair condition. We then hooked up with trail 3 and rode that until we hit trail 13 into rockland. We got bumped around a lot today on the trails, but it was much better than blowing up motors! 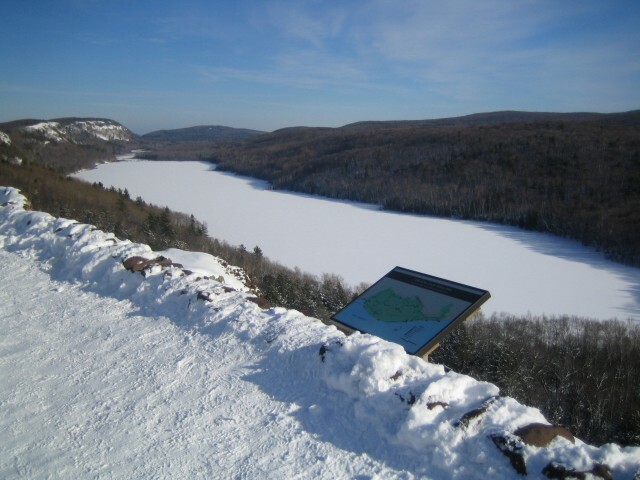 After our adventures last night we decided to head for Lake of the Clouds. We took trail 13 to trail 102 to trail 12 then to trail 1. 13 was in much better shape because it was groomed last night. 102 was in awesome shape and so was trail 12. We stopped in White Pine at Konteka and got some food. Then we headed north on trail 1 to Silver City. Trail 1 was also in awesome shape! We got up to Lake of the Clouds pretty quickly because the road was in awesome shape! It was a beautiful day and the view was spectacular as always! On the way down our luck changed a bit. One of the other guys motors decided to let go as well. We towed it to the nearest road and then dropped him off at Foot Hills so he could eat and stay warm. After riding back to the cabin and getting the truck again we drove to pick him up. We loaded up the sled in the truck and headed back to the cabin. Blow Em Up In Bergland! 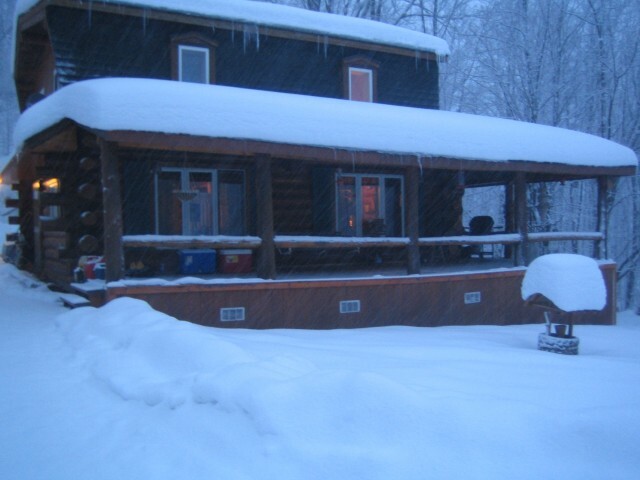 I met up with the Wellington Snow Angels at the cabin and we headed for Bergland. Trail 13 was in fair shape, but could use some grooming. On the way there one of the sleds had a problem so we changed the spark plugs. We headed for the Root Cellar and that same sled had the motor seize. So we got out the tow strap and pulled it back to town. We rode back to the cabin to get the truck and trailer. 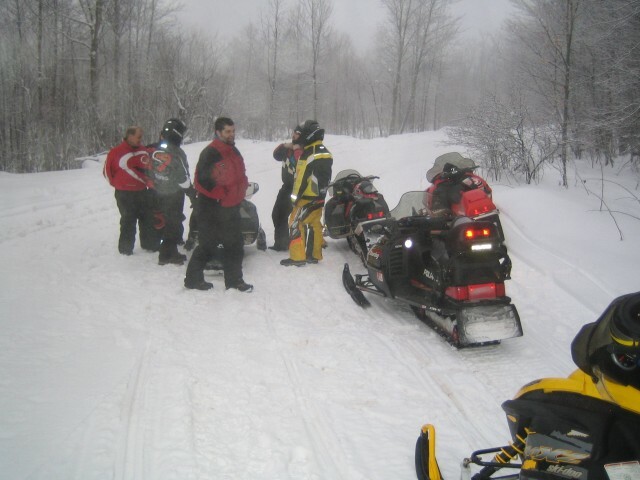 On the way to Bergland in the truck we ran across 2 snowmobilers that were near the road on the trail. Almost in the same spot that I was stuck the night before. One of their tracks was coming apart and they were waiting on help. 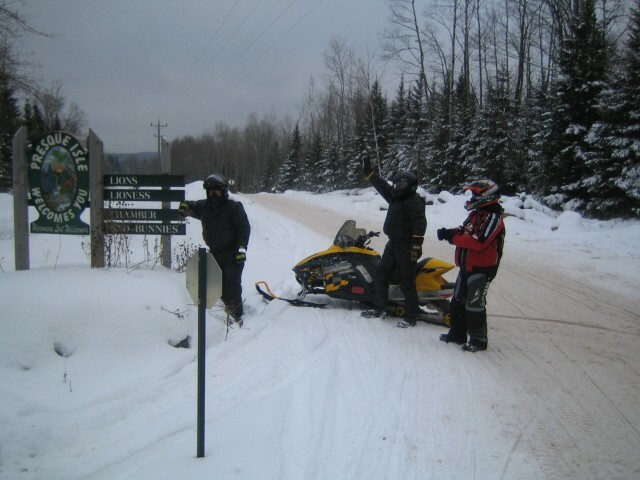 They said they needed to get to Bergland, so we offered to throw the broken sled in our truck and drop him off in Bergland. He was really happy to get inside where it was warm because he had been out in the cold for 3 hours. 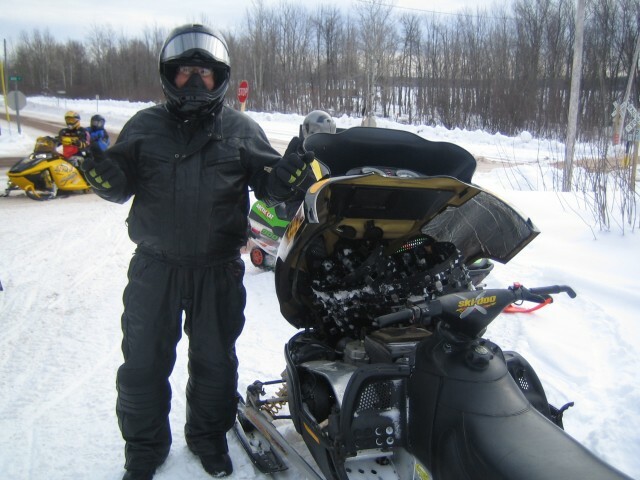 We dropped him off at the Walleye Lodge and then drove to pick up our broken sled. 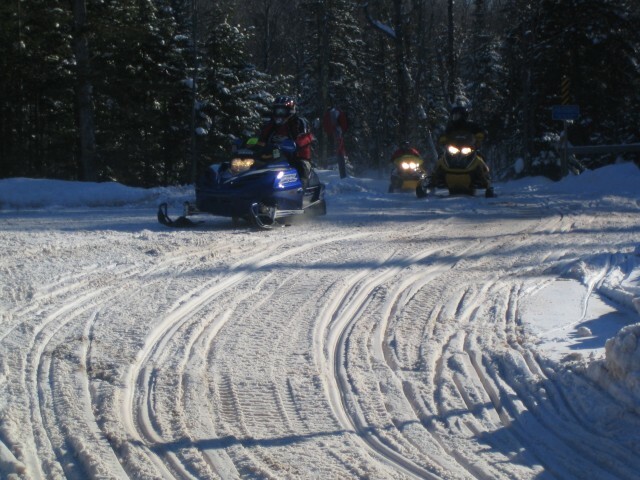 Posted in Trail Reports | Comments Off on Blow Em Up In Bergland! Last Thursday I was on my way to a private cabin to stay for the week. In the last 5 miles of my trip I was driving on a snow covered road trying to make it over a hill when my truck and trailer got stuck. The hill was pretty steep and there was about 6-8″ of snow on the road. It was dark and I didn’t have a whole lot of options when out of no where 4 snowmobilers stopped to help me. We unloaded all the sleds off the trailer and then I was able to get up the hill. I just wanted to say thanks to the 4 guys from Beecher, IL. I owe you one! Posted in Trail Reports | Comments Off on Just Gotta Say Thanks! Today we decided to take it easy after our long ride yesterday. We rode across the lake and headed towards the Hoop N Hollar. On the way there the sled my buddy was riding blew a belt. We changed it and were on our way. After warming up at The Hoop and cleaning off our ice covered face shields we went to the snowmobile dealer to pick up a new belt. 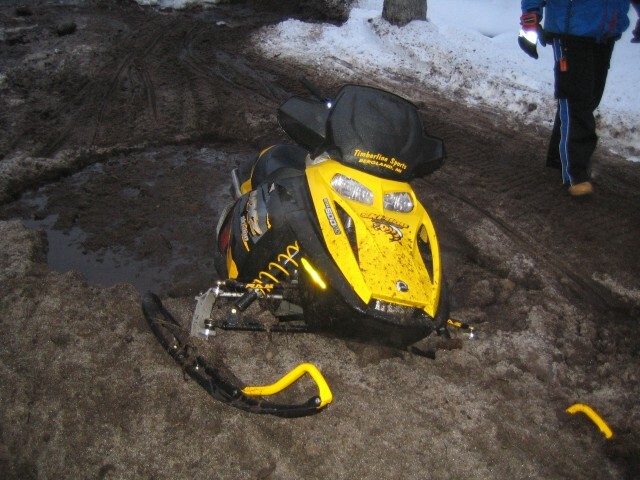 After getting about 3 miles down the trail, the suspension on that same sled decided to let go. The front shock broke and went through the track which ended up wiping out everything behind it. We rode back down the lake to get the truck and trailer to pick up the broken sled. It was a short day, but an expensive one! Posted in Trail Reports | Comments Off on Takin It Easy…. We rose early to get this trip started. We were out the door with the sleds running by 6:30am. 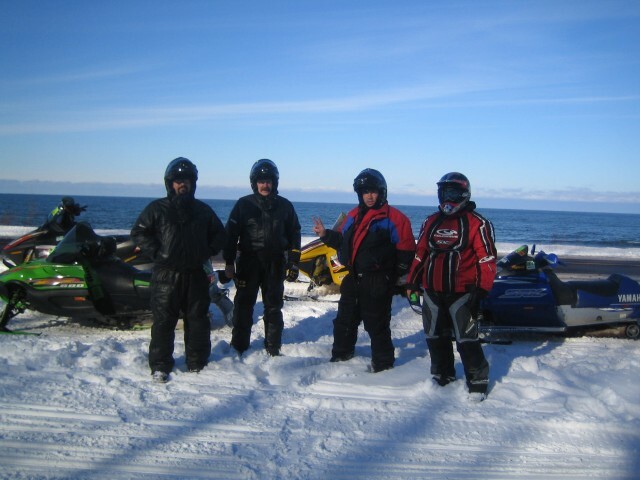 After a quick ride down the lake we met up with the Prairie Riders and got this trip started. It was a warm morning and pretty foggy. We headed to Bergland and gassed up. Then we took trail 8 to trail 13 on our way to Rockland. Both trails were in excellent shape and we were racking up the miles pretty fast. We arrived in Twin Lakes by 9am and things were really clicking. Once we left Twin Lakes and got near Houghton it started to get ugly. The snow was really wet, brown and slushy. We made the best of it and just kept pounding away. Trail 3 was really rutted and there wasn’t a smooth spot to be found. We stopped in Linville for breakfast and then headed towards the Mariner in Copper Harbor for lunch. After we passed Houghton the snow wasn’t as brow, but it sure was bumpy. We arrived in Copper Harbor around 2pm and grabbed some lunch. On the way home we took a slightly different route out of town hoping that it might be a little smoother, but it wasn’t. The one good thing was, it quit raining and started snowing. It was the really wet sticky snow though, so it kept sticking to our face shields which made seeing the trail a little harder. We joined back up with trail 3 towards Houghton and just hung on for the beating ahead. Things didn’t really improve until we got past Twin Lakes again. Even then I would still rate this trail in fair to poor condition. There was a groomer out, and they were panning the trail, but it wasn’t doing much good. It was just too warm. 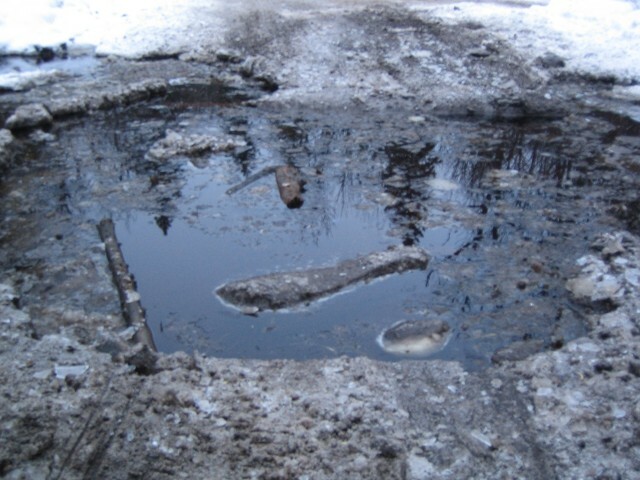 Every time they would pan and then 5 sleds would go over it, the trail was washed out again. We finally arrived in Rockland at Henrys Never Inn and took a break. It was build your own pizza night so we made 2 delicious pizzas. The Prairie Riders didn’t want to eat so they hit the trail and left the four of us to enjoy our pizzas. On the way home we got lucky and rode on freshly groomed trails almost the whole way back. Eventually we did catch the groomer and we passed it. Even then the trails weren’t in bad shape. 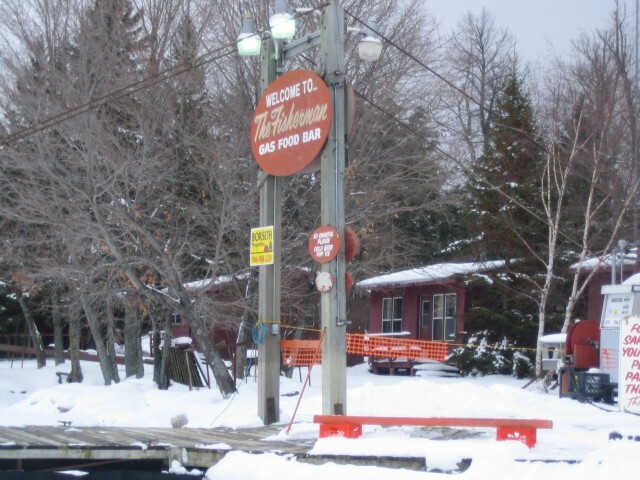 We made our way to Bergland and gassed up before they closed and then headed for the cabin. The morning started off by picking up a rental sled for one of my friends. We rode across the lake to meet up with him while one of my other friends drove him in a truck to the dealer. We got gas at Nordines in Bergland and then rode over to the dealer. 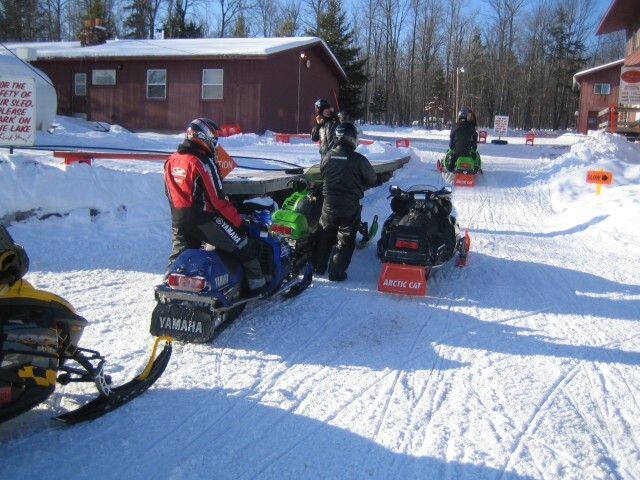 When we arrived all the paperwork was done and we just hopped on the sleds and headed to the hoop to get gas. After getting gas we jumped back on the lake and headed for the cabin. 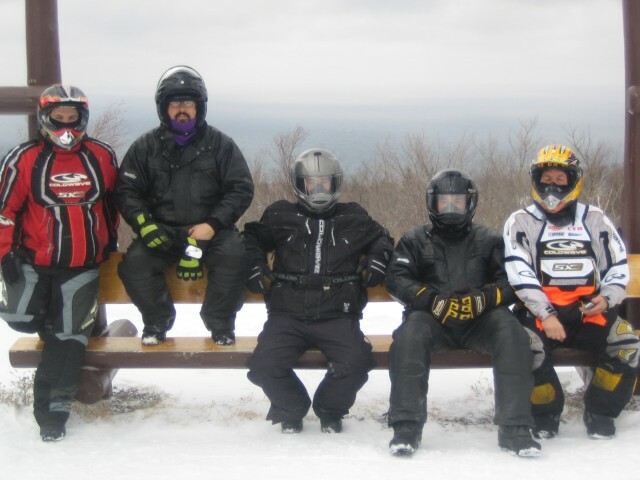 We met up with my other buddy and topped off the sleds with oil. Everyone was hungry so we decided to get breakfast at the fisherman. On the way we swung by the other cabin where the prairie riders were staying to see if anything was going on. Sure enough, one of them had smashed up an exhaust valve in their engine so we sat around and BS’ed for a while. Our appetites were kicking in so we headed across the lake to the fisherman. Three of us had the walleye breakfast, it was excellent as usual. After breakfast we decided to head towards Wakefield. Trail 8 was in decent shape and we stopped in at Bingos. Even though they don’t have much of a menu, this is one of my favorite places to stop. Eugene is very knowledgeable on the area and is one of the friendliest â€œyoopersâ€ I have ever met. 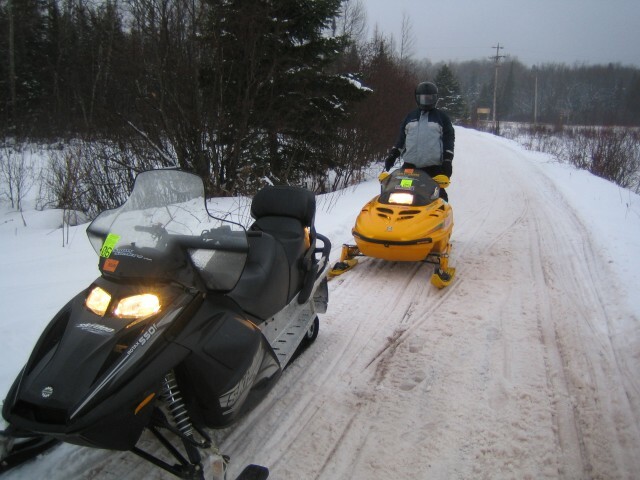 We talked and laughed for a while and decided it was time to start making our way back towards lake Gogebic. All of us needed gas so we rode to town and topped off. We wanted to go back a different way than we came so we choose to go down trail 2 to Marinesco and then get on trail 1 north to lake Gogebic. Trail 2 was in good shape with a few bumps here and there. Trail 1 was in awesome shape, other than the swimming pool found between Marinesco and the Gogebic Lodge. I do not recommend this trail if you have any beginner riders in your group, or if you have anyone that does not like to get wet. My one buddy from Florida ended up getting his rental sled stuck in this pool of mud. Of course we thought it was funny and he was able to laugh it off, but I’m sure if it happened to the wife she wouldn’t be laughing! 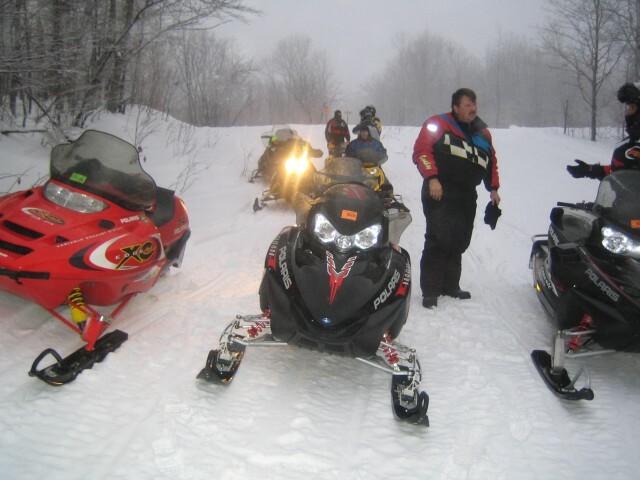 After pulling the rental sled out of the mud we headed for lake Gogebic Lodge. It was Mexican night so we all took advantage of that. The place was kind of empty since it was early, but the food was good. When we left the lodge we headed north to the fisherman and then crossed the lake to the root cellar and then headed north to the prairie riders cabin. We sat around there and shot the breeze for a while before heading back to our cabin. We were done riding by 8pm so we would be fully rested for our trip to Copper Harbor tomorrow! Our new guests arrived around 6pm and we decided to make a trip to Konteka in White Pine. We headed down the lake to Root Cellar and got on trail 13 to head north. Trail 13 has been in great shape since we arrived. There are a few bare spots in the logging areas, but that is expected. We arrived in Bergland and gassed up. Then we took 8 west to 1 north. Trail 1 between Bergland and White Pine has been in excellent shape for the last 2-3 weeks. Most of the trail is a wide road with plenty of snow and has been smooth as glass every time we’ve ridden it. Once we got to Konteka we had a few drinks and watched some college football. After a while we decided to head to Hoop in Holler in Bergland. On our way to the hoop we passed 2 groomers within Â¼ mile of each other. Of course the trails were in great shape in that area! Once we arrived at the hoop we noticed it was closed. We made our way towards Bergland and then headed south on trial 13 again. 13 was still in great shape and we took it to the root cellar again. We got back on the lake for our 1 mile run back to the cabin. 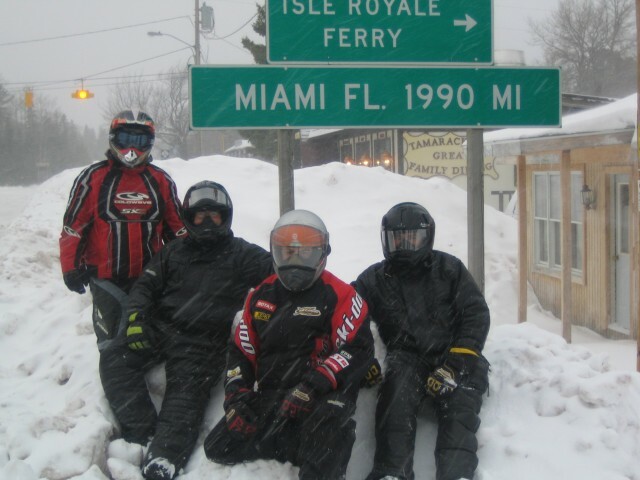 You are currently browsing the Snowmobile Trail Conditions blog archives for January, 2006.